WHEN: March 2 - March 24, 2017. 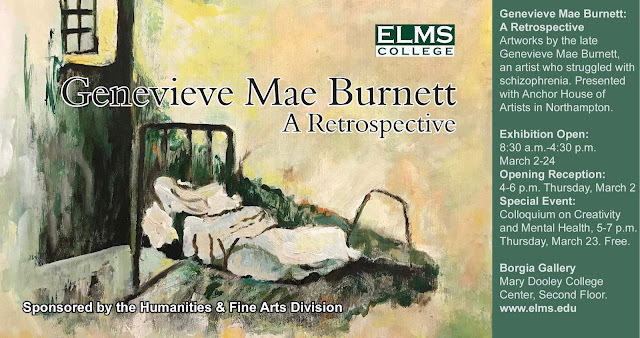 As the Anchor House of Artists celebrates it's twentieth year, we also celebrate the life of a member artist who was with us at the very opening days: Genevieve Mae Burnett, a Retrospective at the Borgia Gallery, Elms College, March 2 through March 24, 2017. Please join us at a public reception on Thursday, March 2, from 4:00 p.m. to 6:00 p.m. , and later in the month, on Thursday, March 23 from 5:00 p.m. to 7:00 p.m. when Michael Tillyer will lead a colloquia highlighting the achievement of this artist.